These Script files were created by ArtRage programmers and forum users, shared in the forums for anyone to use. They add special effects or quick editing actions to existing ArtRage paintings. Note: ArtRage 5 and Lite users should update to version 5.0.5 to play all scripts correctly. ArtRage 3 [Download Now, 120kb] – This package file includes all of the same scripts in a package file that is compatible with ArtRage Studio Pro. This download contains only scripts that will play in ArtRage Lite. To learn more about what each scripts does, and who created it, scroll down to the ‘About the Scripts’ section. Use this script as a shortcut to open ArtRage with a custom canvas size. This script will not work in ArtRage 3 Studio, only ArtRage 3 Studio Pro, ArtRage 4 & 5. It must be manually edited to change the startup parameters. Save the download for your edition to your computer. These downloads are ArtRage Package Files (.arpack). They will automatically install the downloaded resources into your Documents folder when opened with ArtRage. You can select which scripts you want to install during the process. To use the scripts, go to File > Play Script and browse to the script file you want to use. ArtRage may prompt you to save, but all the scripts in these downloads be played inside an existing painting without replacing it with a new canvas. If you wish to experiment with editing the script directly, open it with a simple text editor, and make sure to resave it as a Unicode .arscript file when you have finished. The original code and discussions are available in the forums, so follow the links in the ‘About the Scripts’ section to find out more about individual scripts. Most of these scripts are more complicated than recording a simple painting process, and may include commands that are not compatible with all editions of ArtRage. All scripts are compatible with ArtRage 3 Studio Pro, ArtRage 4 and ArtRage 5 (version 5.0.5 & later). Some of these scripts create effects that were added as a proper feature in ArtRage 5 (e.g. the Layer Effects), so the scripts may not be very useful as there is an official software process for that feature now. Many of these scripts use features not found in ArtRage 3 Studio or ArtRage Lite, so will not run in these editions. 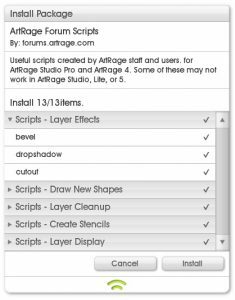 Download the ArtRage Lite package file for scripts that will definitely work in ArtRage Lite 5.0.5 and later. Draw customizable geometric shapes in a current painting with the selected tool and color. Five Circles: Simple script for drawing concentric circles. Created by ArtRage staff. Source: Script Programmer’s guide [PDF]. Circles (unlimited concentric circles). Created by Andy. Original post. Grids (adds grid as paint). Created by Andy. Original post. Grid overlays added in ArtRage 4.5 and ArtRage 5. Epicycloid (spirograph). Created by terrygillooly. Original post. Selected Paint to Stencil: Converts selected paint into a stencil. Created by Charlie. Original post. Selection Shape to Stencil Converter_GL: Converts selection shape (ignores paint) into a stencil. Created by Someonesane. Original post. Add customizable effects to a layer or selected paint. Layer Effects are now a separate feature in ArtRage 5. All created by Andy Bearsley (ArtRage programmer). Display layers as a scrolling slideshow with controllable speed and repetition. Slide Show. Created by terrygillooly. Original post. Animator (Slide Show with no transitions, may be more stable on macOS). Created by terrygillooly. Original post. MultiMerge: Merge all visible layers, leave hidden layers unmerged. Option to retain a copy of merged layers. Created by terrygillooly. Original post. Export named layers Created by relaxedromance. Original post. Scripts Manual: How to record and play scripts inside ArtRage.